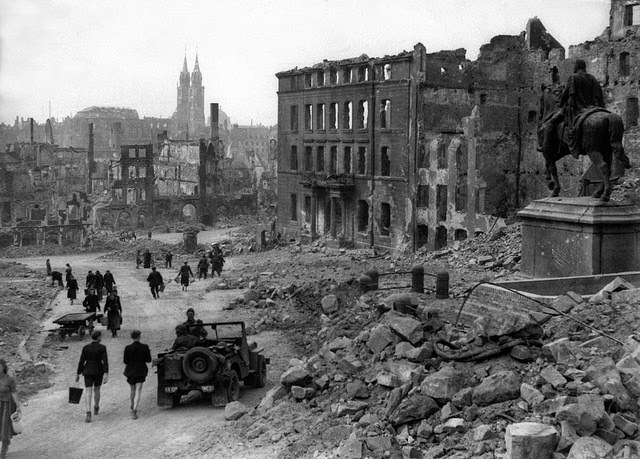 Today is the 70 year anniversary of the American troops marching into Nuremberg. It was planned to coincide with Hitler's birthday. Pictured below: Nuremberg, 1945. You might not expect it, but the arrival of the Americans is an event that is not only celebrated in Germany today, it was even celebrated back when it happened. Just before the Americans took the city, the Nazis had informed the citizens that Nuremberg had to be held, had to be kept in Nazi hands regardless of the cost. Anyone caught trying to surrender would be executed. 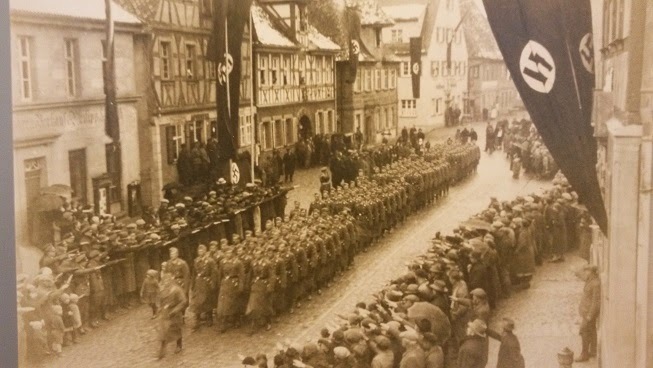 So when the American soldiers marched into town, the average German citizen was relieved that the war was over. I'm not going to get into reasons why the war happened or how absolutely despicably the victims were treated. What I wanted to show today was how much of the country has learned something from it. I'm going to illustrate it with my local museum. My town Herzogenaurach was mentioned in official documents in the year 1021 for the first time, so there is a lot of history to cover. The museum has three small stories, and one very large section is devoted to World War II. Here are just a couple pictures. 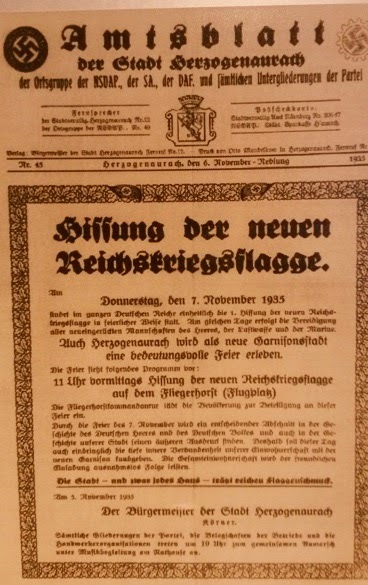 The local newspaper, announcing in 1935 that the new Nazi flag would be raised. What gave me the chills was that the layout of our newspaper up until a month ago was almost the same, just using a modern font, and without mention of the Nazi party and the swastikas. The main street in our town, decorated with swastikas. This is a street I now walk along several times a week. I bring my son to choir practice. I go to the bakery. I get a scoop of pistachio ice cream at Carlo's, or a bite to eat at the Turkish place, or peruse the bookstore. It makes me think of how easily something like this could happen anywhere - in a place we think of as "normal." And how often it has happened, over and over everywhere in the world. And it makes me wonder, for example, what the US would be like if every little hometown museum had a section devoted to reminding people of the slave trade and the mistreatment of Native Americans. All pictures by me unless otherwise specified.